No other event quite marks the start of beach season quite like the Sea and Sand Festival on Folly. This year marks the 23rd year for the festival and street fair to celebrate the Edge of America, so mark your calendars for April 13 and 14 and get ready for a good time. As Follys most-attended annual event, the Sea and Sand Festival pulls 10,000 to 15,000 visitors to the island town each year with its music, food, vendors, Coffin Island 5K Fun Run/Walk, and surfing competitions. With so much going on, theres something for you and everyone in your family. Your dog is more than welcome too, as long as hes on a leash. The party kicks runs from 10 a.m. to 5 p.m. on Saturday April 13. 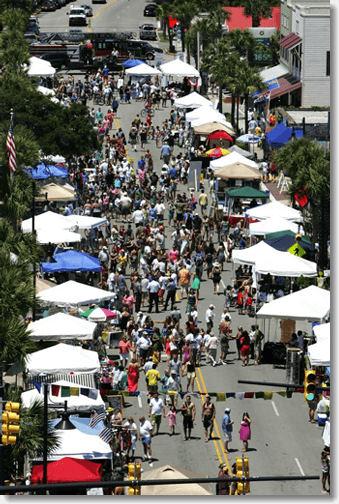 Center street will be closed to traffic, and over 100 food and art vendors will set up along the thoroughfare. All day long, there will be fun and games for the kids, a silent auction, a 5K run, and live music on two stages. Bands include favorites like James Justin and Co., Fuller Condon and The V-Tones, the Shakin Martinis, Sweet T n A, Folly Beach Reggae Allstars, and Folly Bluegrass Society. Admission is free. Then, finals of the Kickoff Classic Surfing Competition and the Coffin Island Sand Sculpture Contest will be Sunday on the beach at the end of Center Street. If you want to dig and sculpt like a pro in the sand sculpture competition, e-mail Vince Perna (vperna@dunesproperties.com). Or for more information and to sign up for the Coffin Island 5K Fun Run/Walk, then get in touch with Terra Kinder at 843-883-4049. Visit follybeachfestivals.com for all the specifics. Folly Beach is such a fun place in Charleston, SC. I live here, and love to venture over there a few times a year from what locals consider the other side of town in Mount Pleasant. It's just a great place to feel like you aren't in Charleston for the day.